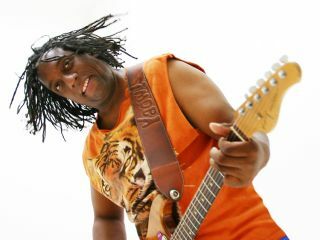 The versatile jazz-rock-funk guitarist Hiram Bullock has died, aged 52. Bullock recorded his own solo albums, but was best known as a sideman. He recorded and played live with artists diverse as Sting, Stevie Ray Vaughan, Steely Dan, Kenny Loggins, Marcus Miller and jazz dons Gil Evans and David Sanborn. Bullock also appeared as a regular on US TV's Late Night With David Letterman, as the "barefoot guitarist" Letterman's 1980s in-house outfit, The World's Most Dangerous Band. Born in Osaka, Japan, to parents then-posted with the US military, Bullock moved to the US aged two. He learned to play piano, saxophone and bass, before switching to guitar at 16. At Miami University, he studied alongside future modern jazz stars Pat Metheny and Jaco Pastorius, and was soon playing in New York for stars including Billy Joel, Paul Simon and Chaka Khan. His jazzier playing was also showcased in Gil Evans' band and Jaco Pastorius's trio in the bassist's final years. One of Bullock's most memorable moments, however, came via his solo on the Jimi Hendrix song Little Wing, on Sting's 1987 album Nothing Like The Sun. The ex-Police frontman recruited Gil Evans' entire band just for that track, after playing live with them. Bullock had been suffering from throat cancer, accelerated by drug abuse. He posted his final, poignant blog in March 2008. You can see his talents at his website's multimedia page. Bullock played with numerous musicians. But at heart, he believed in his own well-proven ability: "I believe that the sound comes from the hands," he once said. "If you're playing your guitar and I pick it up, I'll still sound like me." Watch Hiram Bullock and Stevie Ray Vaughan.